1963, Mexico, Maine. The Wood family is much like its close, Catholic, immigrant neighbors, all dependent on a father’s wages from the Oxford Paper Company. Until the sudden death of Dad, when Mum and the four closely connected Wood girls are set adrift. 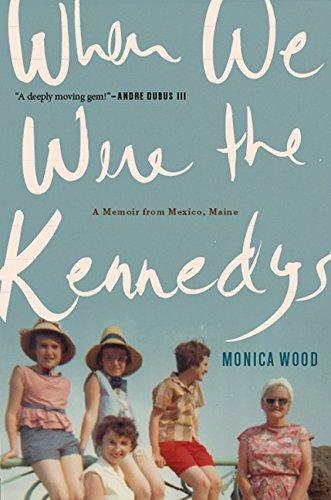 Funny and to-the-bone moving, When We Were the Kennedys is the story of how this family saves itself, at first by depending on Father Bob, Mum’s youngest brother, a charismatic Catholic priest who feels his new responsibilities deeply. And then, as the nation is shocked by the loss of its handsome Catholic president, the televised grace of Jackie Kennedy—she too a Catholic widow with young children—galvanizes Mum to set off on an unprecedented family road trip to Washington, D.C., to do some rescuing of her own. An indelible story of how family and nation, each shocked by the unimaginable, exchange one identity for another. Monica Wood is the author of four works of fiction, most recently Any Bitter Thing, which spent 21 weeks on the American Booksellers Association extended bestseller list and was named a Book Sense Top Ten pick. Her other fiction includes Ernie’s Ark and My Only Story, a finalist for the Kate Chopin Award.